The ambitions of a corrupt Roman consul would belittle Alexander’s conquests if he could realize them. He intends to assert control over the entire Silk Road, starting with the sleepiest stretch in western China. However, the impossibly upbeat captain of the Silk Road Protection Squad and a band of maverick centurions will stand against him in Daniel Lee’s Dragon Blade (trailer here), which opens this Friday in New York. Huo An always tries to avoid physical violence. Yet, despite his status as a heroically departed general’s only true protégé, he has been banished to the provincial Wild Geese Gate due to trumped-up corruption charges. Apparently he is quickly rehabilitated, because he has already re-assumed command of the Silk Road forces when a Roman remnant arrives in all their glorious belligerence. First they fight, but they quickly forge a wary truce. Real camaraderie between the Han Silk Road forces and Roman soldiers follows soon after. When word arrives Huo An’s men must rebuild the crumbling city in fifteen days, the Romans agree to help in exchange for assistance reaching the legitimate Roman authorities in Parthia. Combining Roman engineering with good old fashioned Chinese slave labor, they do indeed rebuild a shining city on a hill, throwing in a few extra aqueducts just because they enjoy building them. Unfortunately, the villainous Tiberius does not appreciate Han do-gooders aiding his enemies. After all, he has a young brother to kill in the astonishingly annoying Publius, who has thus far been protected by the world weary Lucius and his band of brothers, which now includes the honorary centurion Huo An. 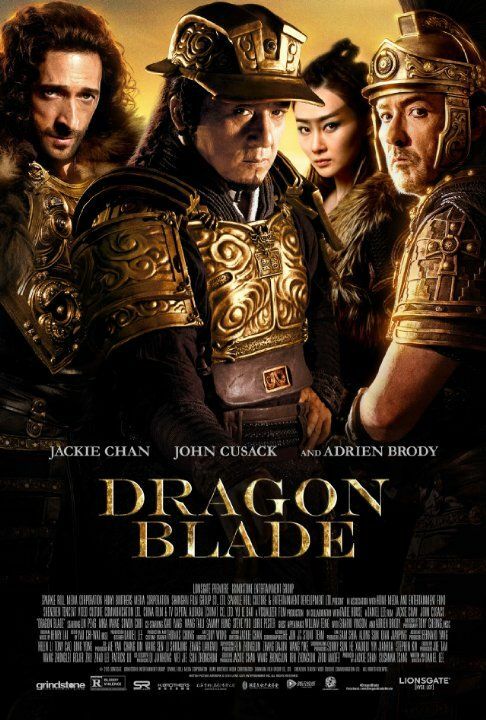 Dragon Blade is not terrible, even though it has nearly all of the shortcomings you would fear. Of course, it starts with casting of John Cusack and Adrien Brody as Lucius and Tiberius. Probably no actors have looked or sounded more out of place in a classical antiquity setting since Edward G. Robinson appeared in the Ten Commandments. While Cusack seems to be trying to slouch through the film unnoticed, Brody is conspicuously dull in role that requires serious flamboyance. Chan is hardly blameless either. Although he thankfully reins in the shticky comedy, Dragon Blade is a perfect example of his burgeoning martyr complex, which he shamelessly indulges. It also reflects his increasingly problematic Mainland-centric China chauvinism. According to Huo An, Westerners are trained to kill people, whereas Chinese soldiers serve to protect. Okay, while you’re at it, why don’t you explain to the emperor how the common people would like more say in issues of governance—or try telling it to Beijing today. Tens of thousands of Hong Kongers came to the Admiralty to do exactly that, but Chan didn’t want to hear it. Yet, one of the coolest things about Dragon Blade is the democratic idealism represented by Wild Geese Gate, as well as the massive CGI awe of the place. There are also some pretty spectacular warfighting scenes that inventively combine the styles of the two rag-tag forces united against Tiberius’s armies. Old Man Chan can still handle himself in a hand-to-hand scene, when he is not lecturing his audience and Lin Peng similarly makes the most of her limited screen time as the Hun warrior princess Lengyue. Costume designer Thomas Chong also takes full advantage of the opportunity to create costumes in the traditional styles of at least a dozen distinctive nationalities. Regardless of Chan’s ideological baggage, director-co-screen writer Lee takes viewers on a rough narrative ride. There are more conspicuous gaps in Dragon Blade than Hillary Clinton’s email archives. 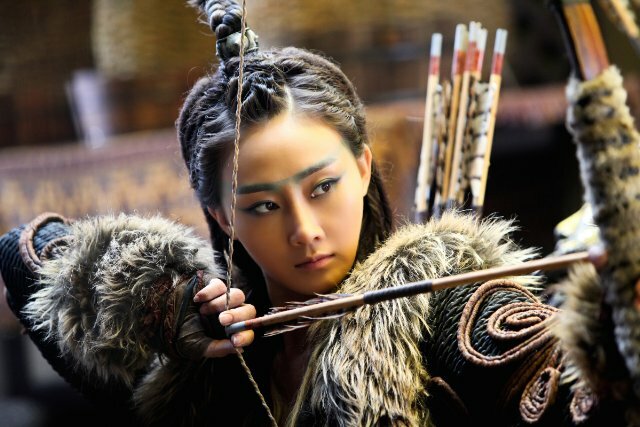 Reportedly, twenty-some minutes were cut from the Chinese version for the American theatrical print, including a modern day framing device featuring Karena Lam. That was probably one of the easiest parts to lose, but as it is currently cut, characters’ allegiances will change drastically and considerable geographic distances will be traveled all quite suddenly without anyone taking any notice. That is just life on the Silk Road. A chaotic mixed bag, Dragon Blade lacks the mature and engaging heft of Chan’s work in the unfairly dismissed Police Story: Lockdown and The Shinjuku Incident. For diehard fans, it opens this Friday (9/4) in New York, at the AMC Empire.